Glurmo is the public face of the Slurm Factory. 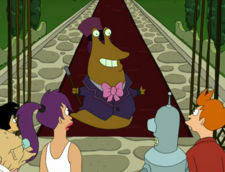 Inspired by the character Willy Wonka, in "Fry and the Slurm Factory" he leads the tour Fry and friends take. Durring the events of the episode, Glurmo was cut in half, creating two, smaller Glurmos, refered to in scripts only as Small Glurmo #1 and Small Glurmo #2. Small Glurmo #1 returns for a cameo in the next season. Billy West does the voice of Glurmo as a whole as well as the two halves of Glurmo. Glurmo as a whole is an impression of Gene Wilder as Willy Wonka, while Small Glurmo #1 is Peep-eye's voice from the "Popeye" cartoon series. 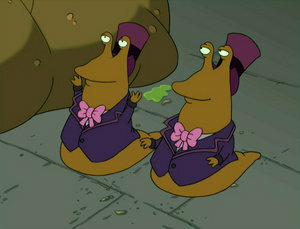 Glurmo #1 is killed in the episode "Anthology of Interest II", when he is eaten by Nibbler in the section "Wizzin'". Glurmo: Welcome to the wondrous world of whimsy we like to call... Slurm Centralized Industrial Fabrication Unit! Small Glurmo: [in a deleted scene] Why, you mother-father, you son of a beach towel, you rotten basketball! This page was last edited on 26 November 2016, at 07:45.